ERPs reduce a business’s risk in uncertain circumstances and are perceived to have a positive impact on organization performance, including the improvement of productivity and profitability. ERPs are the lifeblood of large retail operations. There are serious financial and non-financial boosts to a company who can organize itself around an ERP. Historically, however, in order to properly organize and orchestrate ERP data flow, customer-facing tool options have been limited. This is because ERPs rely heavily on EDI and APIs to sync with outside systems. EDI is the more traditional approach and still often used in B2B and wholesale channels, and Walmart specifically. APIs are the more modern approach, and used by SaaS services and tools that enable marketing teams to move quickly, while ensuring proper data orchestration is not disrupted. ERPs are essential in allowing retailers to offer multichannel experiences to their customers. They allow the retailer to have a single, comprehensive view of their customers, orders, inventory, etc. The alternative is to have a disjointed understanding of your channels which results in a disjointed customer experience – and lower revenue. Cloud and thus SaaS platform APIs vary based on platform. Call limits are important considerations for brands looking to integrate with a SaaS solution. Nonetheless, nearly all SaaS solutions have APIs, and with the rising tide shift from on-premise and custom built technology to cloud solutions (which decrease tech debt and speed up GTM), the API Economy has taken off. The benefits of SaaS integration, specifically for the ecommerce channel, are huge. As Amazon continues to own the commodity market and 55% of U.S. consumer product searches, and micro-brands begin to disrupt their legacy competitors, innovation and speed to market have become table stakes in the retail industry. Innovation has historically been seen as the final step to realizing ERP benefits – but too few brands have gotten to that step, and fewer still have been able to innovate as effectively as Amazon or the litany of rising micro-brands. Once scalable and quick innovation GTM can be met for specific channels – in this case ecommerce – even more can be automated and then forecasted for better business decisions and increased time and capital resources. SaaS solutions like BigCommerce enable innovation on the cloud, while providing unlimited API call volumes syncing data in near real time. Of course, the ecommerce platform is only a cog in the machine of complete data orchestration for retailers. And, there are a variety of ERP framework theories and options based on a retailer’s needs and priorities. First, let’s look at the 5 most common ERP integration patterns. Modern retailers require modern data management and orchestration. For many organizations, an ERP fulfills this need. ERPs can automate processes, enable planning and forecasting, and ultimately enable innovation by giving teams across an organization the ability to access and leverage the most up-to-date customer, product and accounting information in order to streamline business processes and create the most effective services and solutions. In order for it to happen, businesses need to develop an ecommerce ERP integration strategy to make sure it connects with the necessary enterprise systems. In other words, data orchestration is required. When considering the variety of ERP integration needs, common patterns emerge. Patterns, as denoted below, are the most logical sequence of steps to solve a specific type of ERP problem, and are established from actual use cases. ERPs operate as a hub and collaboration center for various business functions and department. A well integrated and accessible ERP allows each business unit to access much needed information and data, and can help tear down silos within an organization that can lead to costly mistakes or missed opportunities. Data migration ERP integration is moving a specific set of data at a particular point in time from one system to another. A migration pattern allows developers to build automated migration services that create functionality to be shared across numerous teams in an organization. Developers can set the configuration parameters to pass into the API calls so that the migration can dynamically migrate scoped ecommerce data in or out of the ecommerce SaaS platform (like BigCommerce) either on command or on an as-needed basis via an API. The broadcast ERP integration pattern moves data from a single source system to multiple destination systems in an ongoing, near real-time, or real-time basis. This a one-way synchronization from one to many. Typically “one-way sync” implies a 1:1 relationship; the broadcast pattern creates a 1:many relationships. Broadcast patterns keep data up-to-date between multiple systems across time and allows for the immediate transfer of data between systems. For instance, broadcast patterns update inventory levels across omnichannel sales touch points including marketplaces, brick and mortar stores, your branded website and wholesale partners. The aggregation ERP pattern takes or receives data from multiple systems and copies or moves it into just one system. Aggregation removes the need to run multiple migrations on a regular basis, removing concerns about data accuracy and synchronization. It is the simplest way to extract and process data from multiple systems into a single application or report. The aggregation ERP pattern enables the extraction and processing of data from multiple systems and merging them into one application. Can be processed or merged to produce any desired dataset or report. 4. The Bi-Directional Sync Pattern. Bi-directional sync ERP integration patterns unite multiple datasets in multiple different systems, causing them to behave as one system while allowing them to recognize the existence of different datasets. This type of integration comes in handy when different tools or different systems, which are needed for their own specific purposes, must accomplish different functions in the same data set. Using bi-directional sync enables both systems to be used and maintains a consistent real-time view of the data across systems. Bi-directional sync integration enables the systems to perform optimally while maintaining data integrity across both synchronized systems. The correlation pattern singles out the intersection of two data sets and does a bi-directional synchronization of that scoped dataset, but only if that item occurs in both systems naturally. Bi-directional synchronization will create new records if they are found in one system and not the other. The correlation pattern will synchronize objects as long as they are found in both systems. The truth is that without a rock-solid ERP, big brands selling online can’t keep up with Finance + Operational data and processes. Especially as they grow and sell across multiple channels. Keep in mind too that ERPs are not one-size-fits-all. At eBridge, our customers usually figure out their business priorities, and then back into the right ERP for their biz before they come to us for eCommerce integration. You see, some ERPs are better suited for product lots, or for shipping, or even for growth across multiple locations. Make your retail site more flexible and innovative while also saving time, money, and launching your site faster. Now that you understand ERP integration patterns, let’s look at a variety of ERP integration frameworks to get the full picture. We’ll begin up close looking at the APIs and webhooks required of a modern SaaS ecommerce platform for ERP integration. We’ll then back out to get a fuller view as complexity increases. An ERP is the only sensible way to approach and sustain an omnichannel operation. These systems ties all elements into one data-backed system. 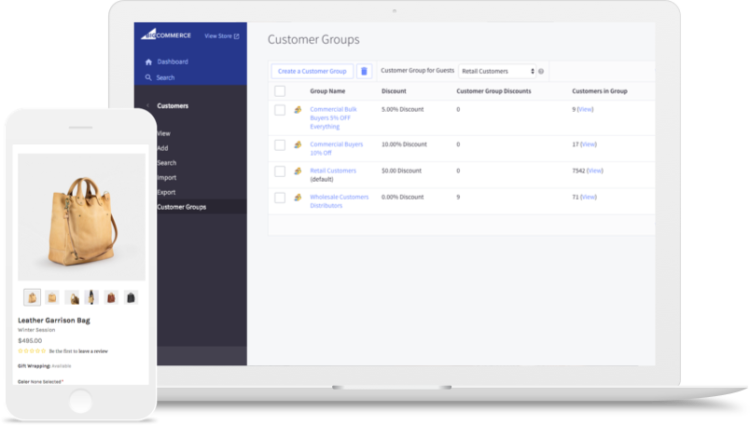 ERP sounds big and expensive, but most business order management systems and omnichannel ecommerce platforms, like BigCommerce, are built on or ensure they easily integrate with an ERP of your choice. In the ERP integration framework above, a system integrator converts data from APIs and sends them to the ERP through the necessary EDI protocol. The Ecommerce ERP system integration framework above is a zoomed out view of the one prior it. We are still looking primarily at the ERP integration functionality between an ERP and a retailer’s ecommerce channel. In this view, you can see the role of the system integrator much more clearly as data is passed through via bi-directional and correlation patterns –– or more simply, through a pipeline. All 5 of the EDI/API patterns above are forms of a messaging system. ESBs (and webhooks for that matter) are “push” systems, where there’s a conveyor belt of messages that are sent to some destination. APIs are “pull” systems, where the consumer of the information requests some information, and then there is a response (request/response). This is still an API to EDI example, but API to API works similarly as information is validated, transferred and converted for automation. In the above framework, you can see the full omnichannel ERP integration framework, including integrations with a PIM, CMS and ESP. This is the full view of a possible ERP integration and data orchestration framework for a large omni-channel, international retailer. Nearly all of of the ecommerce ERP integration patterns are used in this scenario, as well as a system integrator. It can be easy for large brands to lose a high-level view of all the processes within the business such as marketing, sales, inventory, finance, product planning, etc. By implementing ERPs to keep track of these processes in real-time, you can reduce time–consuming tasks such as testing, training, configuration, documentation, and more. For those retailers looking to move to a modern ERP integration framework, you’re in luck. Modern ERP integration frameworks are one way for businesses to realize innovation speed and profitability among fierce competition from Amazon and micro-brands. That said, ERPs have some serious weaknesses that APIs and service-oriented architectures were meant to solve. Many large brands choose a combination of both for quick speed to market along with advanced data orchestration. After all, legacy retailers wrestling with data orchestration are being squeezed from both the top and the bottom –– while trying to manage existing systems and allow for marketing innovation that solidifies your place in market. For your ecommerce channel, the best way to do that is utilize a SaaS solution like BigCommerce that allows flexibility at the presentation layer for UX and innovative experiences, as well as extensibility at the API layer including unlimited call volumes. For those considering a migration, here is a simpler workflow for how BigCommerce plays in to your data orchestration.